NBC’s visually striking Game of Oz, er, Emerald City, is about cutthroat power-seekers and their oft-brutal methods in a down-and-dirty but nicely costumed land where a feared flying object casts a giant shadow. It’s also a previously scrapped enterprise based on the L. Frank Baum book series. But “creative differences” between NBC and the original show runner were resolved by bringing in David Schulner and long-ago teen idol Shaun Cassidy to helm the 10-episode first season. In a letter to TV critics accompanying DVDs of the entire season, they note that because Baum’s books “were not originally written as children’s tales but as political allegory, their core themes still resonated for us. One hundred years later, women are still fighting for empowerment, science and religion/magic are often at war and the pursuit of identity -- racial, gender and otherwise -- remains at the forefront of our political and cultural conversation.” Oh, all right then. Abandoned at birth and raised by kindly adoptive parents, Dorothy Gale (Adria Arjona) remains front and center. But this time she’s a young adult woman who wears a police officer’s leather jacket instead of a patterned blue gingham dress. She also packs a pistol while Toto is a German Shepherd. But a tornado is still Dorothy’s vehicle in getting from Lucas, Kansas (pop. 393) to Oz, where lots of hell is breaking loose. Your friendly content provider watched the first five episodes plus the season-ender to see how much viewers would be left hanging if NBC doesn’t order a Season 2. Let’s just say there’s closure but also open-ended possibilities. So your investment wouldn’t be all for naught. Friday’s two-hour premiere, paired with the return of Grimm, makes for a compatible supernatural one-two punch. Emerald City has a much bigger and bolder look, though. The storyline may not always be fully intelligible, but this sure will look good in HD on bigger-is-better home screens. Dorothy initially is a nurse before a violent night in a really bad storm puts her in possession of a police jacket and police dog. She awakens in a forbidding, snowy land and eventually is water-tortured by fearsome looking tribesmen with painted faces and wooly outfits. They demand to know just how she got to Oz, but she hasn’t a clue. So it’s eventually decided to exile her on a yellow brick road to Emerald City, where she’s expected to answer to The Wizard (a sometimes unintentionally laughable Vince D’Onofrio from NBC’s Law & Order: Criminal Intent). Toto, by the way, is the tribe’s term for dog. So there ya go. 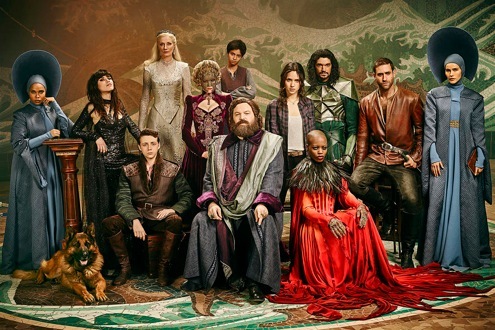 Meanwhile, back at the Palace, a coltish Wicked Witch of the West (Ana Ularu) is conspiring against her not-so-good sister Glinda (Joely Richardson) while everyone wants to know the whereabouts of the Wicked Witch of the East (Florence Kasumba). But news has spread of “the girl who fell from the sky,” prompting the Wizard to send members of his royal guard on a search-and-destroy mission headed by a seeming despot named Eamonn (Mido Hamada). Dorothy and Toto find an ally in “Lucas” (Oliver Jackson-Cohen), whom they first encounter hanging from a cross and covered with mud and um, straw. Emerald City also introduces decidedly different variations on the Tin Man and Cowardly Lion, but you’ll have to see for yourself. Other pivotal characters include the imprisoned boy Tip (Jordan Loughran), who’s not what he seems, and his friend, Jack (Gerran Howell), who’s fated to undergo quite a transformation. None of this looks as though it was done on the cheap. Emerald City never loses its curb appeal through an at times meandering and cockamamie tale of powers gained and lost. You’ll also get some contemporary tunes, courtesy of Dorothy’s iPhone. Lucas, for one, is especially astounded to hear “Ain’t No Sunshine” through some ear buds while The Wizard later opts for a Pink Floyd tune. The escapes and re-escapes pile up as this recurrently grisly tale tries to cast its spell. Dorothy’s end game is just to go home again, even if Lucas, Kansas has pretty much been a dead end for her. Oz surely is a much more happening place, although far more perilous than it was back in the 1939 Judy Garland musical. It’s not at all a nice place to visit -- and you certainly wouldn’t want to live there. But Emerald City has its moment as a vicarious, danger-packed thrill ride replete with jolts, wonders and ample shivers amid its shimmers.